Washington’s Nene was handed down a one-game suspension by the NBA for head-butting and grabbing Jimmy Butler around the neck with both hands and attempting to throw him down during Chicago’s 100-97 Game 3 victory. Nene’s absence could make life a little easier for Noah, who has averaged 12.0 points and 10.3 rebounds per game through three games against Washington. “The game tells you what shots are going to be there,” Bulls coach Tom Thibodeau said on Saturday. 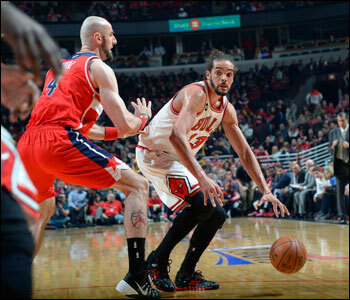 “If his shots aren’t there, Joakim helps us in a ton of ways. His screening I thought was terrific. His defense was very good. So he doesn’t have to shoot and score for him to play well. Thibodeau and the Bulls met with reporters in the afternoon, a couple hours before the league’s announcement that Nene won’t be available to play on Sunday. When asked about how Nene’s potential absence might impact the game, Noah was unsure but he felt the Bulls’ approach would remain the same. On that list, Noah divulged, was eating lunch, taking ice baths and getting to bed early for Sunday’s 12 p.m. CT start. In case you were wondering, Noah was in the mood for brunch and eggs benedict. He’s also in the mood to take what worked in Game 3 and continue on that path before the series shifts back to Chicago for Game 5 on Tuesday. After being unable to hold on to second half double digit leads in the first two games, Chicago finished strong on Friday to make it a 2-1 series. Thibodeau’s reminders this past week that there has been a very small difference between winning and losing certainly rang true. With or without Nene, the Bulls are expecting the physical nature of this series to continue. That’s just the nature of the postseason, said Thibodeau, it is a product of facing the same team several games in a row, and it’s about competing at a high level. “This is the playoffs,” said Thibodeau. “It’s all normal stuff. You’ve got the same teams going at it game after game. It’s great competition and that’s what you look forward to.